Do you like the changes in Version 2.0? I've created a huge mod with a lot of new features, based on the Extended Surgery and Bionics mod by Minus. I really liked his mod, but I had some problems with it. For example the prostheses were way too easy to get, some parts (and especially the organ vat) were overpowered and so on. I also wanted to make it feel more vanilla, like it was always a part of the game. So I decided to make this mod. It's a huge conversion of the original mod with its own ideas and features, so it's worth a download, even if you didn't like Minus' mod. This mod adds tons of new content, and will keep you entertained for countless hours while perfectly blending in with the vanilla atmosphere! If you miss the option to harvest arms, legs and eyes, I've made a small mod that does just that and more! Get it here: Harvest Everything! Just me. Of course some of the code and the idea is based on Minus' Extended Surgery and Bionics mod, but the vast majority of it is written by me and textures are all by myself, too. Latta for the Korean translation! I can't check it, but I'm sure you did a great job! Jozay for the French translation! Dr Z. for his big help on the German translation. It would have taken me ages if you had not helped me! kors for the Russian translation! duduluu for the Chinese translation! homerbra for the Portuguese translation! Dawidienko1 for the Polish translation! Mike2611 for the Spanish translation! 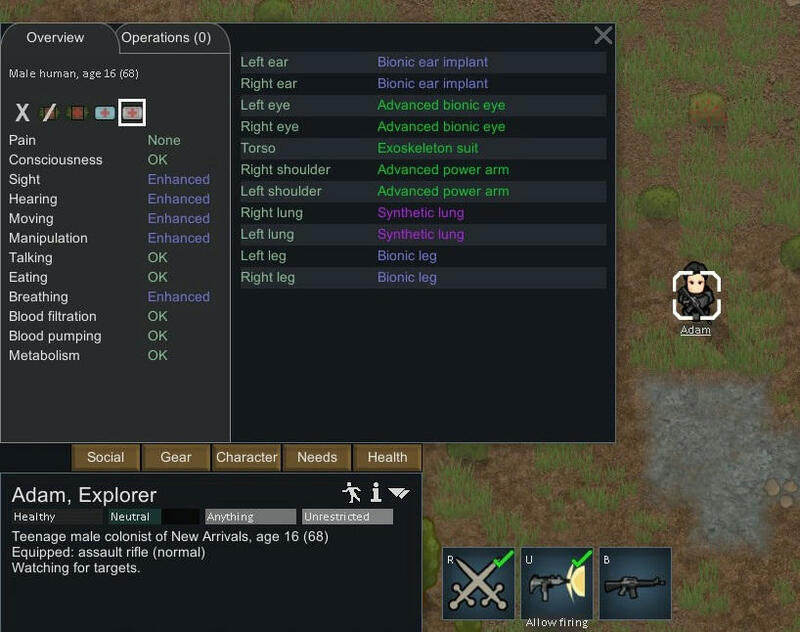 This mod gives you the ability to craft your own prostheses and artificial organs. Starting with basic prostheses like a peg leg or a hook hand, you can research everything you can think about: Simple prostheses like the vanilla ones and some new, bionic body parts and even advanced bionics. But to get advanced bionics you have to do plenty of research and they're also pretty expensive to craft. If you tend to lose your organs, this mod helps, too! You can research and craft surrogate and synthetic organs, so you never have to miss your kidney again! The mod is pretty big, there's enough work to do, so even in endgame there's something new to research, to craft and to buy available. Craft prostheses! There's a wide array from hook hands to exoskeleton suits and even brain implants! Many new parts like hook hands, a silent jaw, a brain stimulator, bionic spines, bionic hands and feet, advanced bionic eyes, medical ribs, exoskeleton suits, auxiliary AIs, cornea implants and many more! Craft organs! Go from rudimentary surrogate organs to high tech synthetic organs! Cure brain damage using late game brain implants! Give uranium a purpose! Upgrade bionics with this totally harmless material! New traders: The textile trader and the prostheses trader! Tons of new research projects! Be Frankenstein! Harvest organs and install them somewhere else! Not brutal enough? Mince spare natural body parts at the butcher table! Suggest new parts or features! Just unpack the folder and put it in your mods directory of your game. Mind the mod order: EPOE should be activated last! This mod works fine with existing colonies! Please read the readme inside of every folder! Can modpack makers include your mod in their modpack? Yes, of course! You don't even have to pm me, just link to the this site, so people interested in the mod alone can find it faster. Can other modders make mods based on yours? Yep. But you have to write me a pm to inform me about what parts of the mod you are using and you have to give me credit. * Added a whole new range of new and even more advanced implants: Glitterworld Parts! * Readded the option to mend scars! * Prosthetics Research now has its own tab! * Updated to Alpha 16! * Added a graft rejection system! * Added an accustoming system! * Readded the option to harvest the stomach, nose, ears, eyes and jaw. Be Frankenstein again! * Introducing: Mincing natural parts! Turn organs into meat at the butchering table! * Released on Steam Workshop! * Added the painkiller rib, that decreases your pain factor! * Natural organs are now more expensive, so sell your kidneys! * Added Russian translation, thanks to kirohq! * The basic prosthetics table now uses stuff! * Updated the Korean translation - thanks Latta! * Updated to Alpha 12! * The drugged rib is back! * Updated to Alpha 11! * Added an artificial pelvis! * Updated to Alpha 10! * Added a German and Korean translation! * Added compatibility for the RW Launcher! * Increased the research cost of advanced and simple prostheses. * Tweaked the description of the wooden foot. Expanded Prosthetics and Organ Engineering! Re: [Mod] (Alpha 9) Expanded Prosthetics and Organ Engineering! This looks great ill definitely check it out. 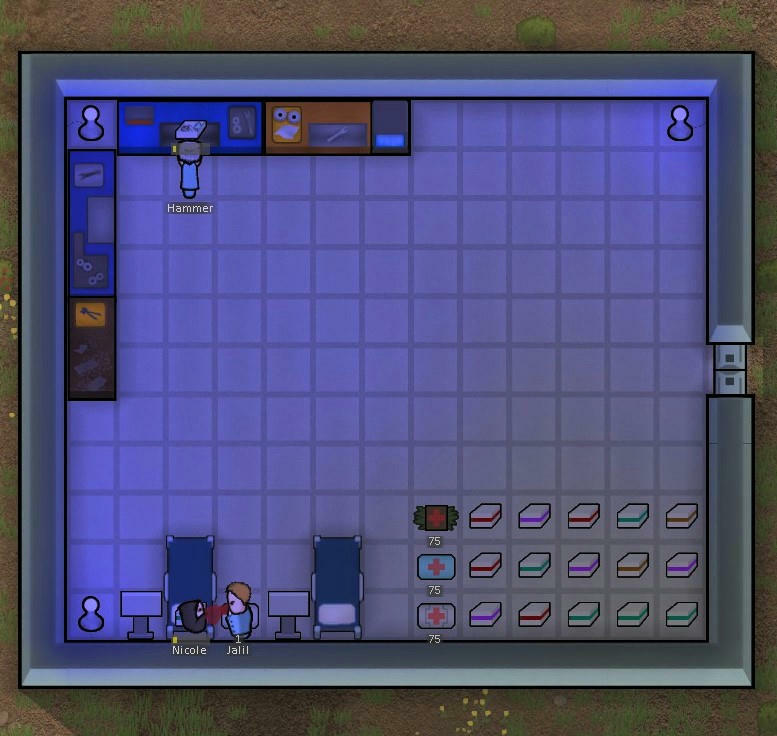 I love the surgery mods and the ability to create super colonists and trying to keep it similar to vanilla sounds really appealing. "Similar to vanilla" is a very good predicate for mods, and after one of my last colonists had to live with half his brain destroyed I really like the sound of more prostheses. But why the hell do you need EIGHT new workbenches? I NEED HELP! For a very long time I haven't received any emails about new posts in subscribed threads. I already asked in the support forum and even PMed Tynan but nobody responds to me. Can anyone help me please? But why the hell do you need EIGHT new workbenches? How To Make Your Own Adam Jensen In 5 "Easy" Steps! Step 3. Give him ALL THE IMPLANTS!!! Step 4. Go into \Mods\Core\Defs\ThoughtDefs, go into Thoughts_ConditionsSpecial, find the prosthophobe thought code and change description to "I never asked for this"
Just wanted to point out, you have the same exact screenshot of Sissy's new prosthetics posted twice. After installing this mod, I can no longer install anything on my colonists. There's only Euthanize and harvest stuff on, no installing. Oh, just realized this. Thanks, more screenshots are coming soon when my Alpha 9 colony is bigger. Ok, that's strange, i'm gonna take a look. What mods do you use, maybe they conflict. I also have the problem where I can't install anything, just harvest and euthanize. Ok, looks like some parts of the code haven't survived the port, I'm gonna release a hotfix today when I have found the problem. Ok, this is really a lot of stuff, might be good to have different workbenches. But there is a mistake with the artificial brain: In the description it say Plasteel, but in the ingredients it says silver. Also, did you raise the build costs for everything made of gold according to your volume change? And why is a market price change a balance for higher volme? If I understood this correctly, these two things have nothing to do with each other. Expanded Prosthetics and Organ Engineering 1.01 - HOTFIX! Thank you all for your feedback, it took me a while but I found the error, you can now install your prostheses and create your superhuman (or Adam Jenson). I feel very bad, sorry for my ubisofting (=too early release of unstable and buggy software). You can redownload the mod from the original post or here (outdated). Thanks, I've fixed the issue with the brain stimulator. I haven't raised the build costs for everything made of gold, I lowered it. That's why I've raised the market price because gold would be as valuable as steel without this change.